Available through Amazon and Red Dragonfly Press. Paul Ėluard once said “There is another world but it is in this one.” Dark Stars, Ken McCullough’s new book from Red Dragonfly Press, presents a compendium of the human condition, always grounded in the natural world, and often in totemic relationships. There is lost innocence, love present, and back through time, there are tributes to friends and mentors. McCullough keeps one foot in the primal world and the other in community, yet he travels confidently from one to the other. You hear the poet making peace with mortality. Dark Stars has a deep and engaging sweep. It is a rough bouquet collected en plein air. We are left wanting more of these harmonies. like a manic orchestra tuning up. The last poem, For Mary Oliver, brings the book to a surprising (and sonnet-like) ending. Yes, we want to say, the gifts have arrived. 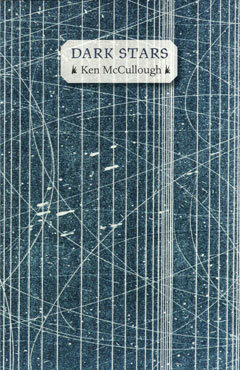 Some of the poems in Ken McCullough’s new Dark Stars are detailed memories and stories from his childhood–wonderful, complex poems. But many of them come from the place where what is free and wild overlaps with what is burdened and human, a feral landscape where crows and coyotes and owls are perfectly at home. Or, as McCullough would have it in “Coyote Tag,” they step on our toes when we are looking the other way. The poet here has an alertness, an eager vigilance, which is a key to thriving (and writing) in this beloved land. In “A Citizen of Two Worlds,” his true compass points to yet a third world: “where the shadows are deep/ and all of us carry the smell of smoke.” The poem “A Lifetime,” has an image I’ll never forget: McCullough addresses a woman “Inscribing my poems on thick leaves/ with a stylus–several dried that way/ others faded and disintegrated.” I thought of Keats’ epitaph: “Here lies One whose Name was writ in water.” McCullough’s is a marvelous image transience, humility, and the confluence of poetry and the natural world. I love this book.